When Maija Grotell began teaching ceramics at Cranbrook in 1938, the program was unformed and students were mainly in attendence to learn how to throw a pot or amuse themselves after working on their “art.” Grotell developed the program into one known for producing fine ceramic artists. Her distinguished students included Richard DeVore, Toshiko Takaezu, Harvey Littleton, and Howard Kottler. Grotell’s own art served as their example. 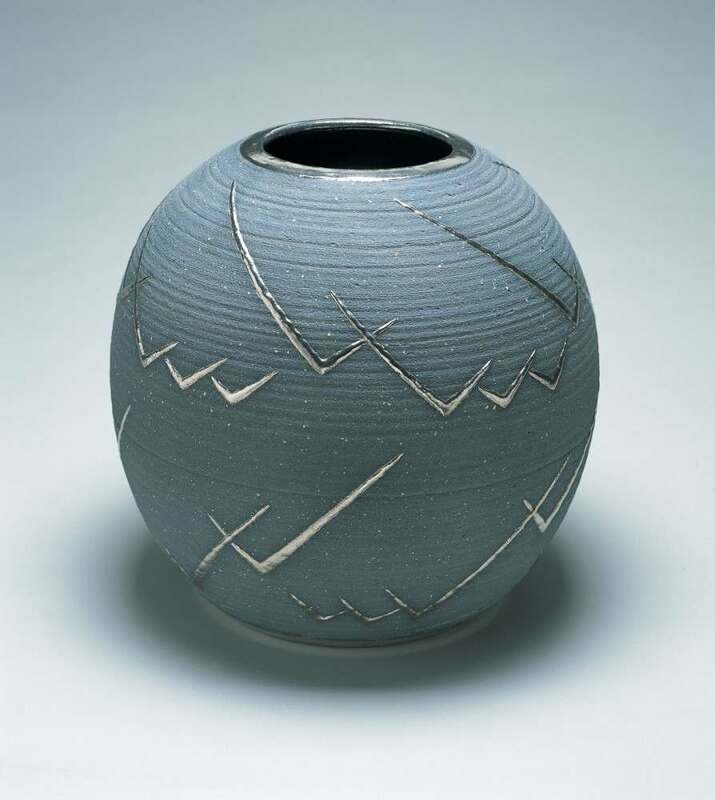 This ovoid vessel with its applied geometric pattern is a superb example of her early Cranbrook work. The visibly expanding and then contracting throwing rings emphasize the large scale of the piece. The horizontal, physical motion of the rings is countered by the surface pattern of highly abstracted bird forms. Raised and glazed platinum to capture the light, the V-forms appear to lift free of gravity and the matte blue unglazed background. The geometric abstraction of nature, also crucial to Saarinen, is simplified by Grotell in this primal rhythmic pattern. The eloquence with which she marries material, form and content, the seen and the sensed, is evidence of her mastery.